The Selma Railroad Run is one of the oldest continuous road races in the State with this years event being the 33rd annual. 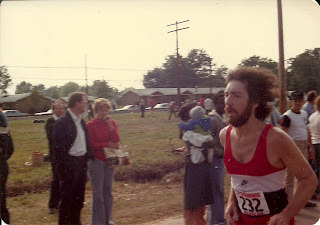 The photo is me approaching the finish line in 1980 when it was a 10k. I ran the event several times back then and so did my brother and even my Mom and ex-wife ran in 1980. Part of the appeal to me is the small town atmosphere combined with a flat , fast certified course at a time of year when there is usually nice weather. I was never able to run as well as I would have liked under those ideal conditions because it was always the week after my favorite race, the Virginia 10 miler, a very tough course which I ran 15 years in a row. In 1980 I ran 43:48, then lowered that to 41:27 in 1981. When I finally returned again in 1990 they had changed it to a 5k and I ran 20:59, which was the last time I was ever under 21:00. (my pr is 18:40 from 1984). I didn't do much racing in the 90's and returned again to Selma in 1995 to see how slow I had gotten and ran a 22:26. It would be another 10 years before I would return once more and by 2005 I was well into my new life as an ultrarunner and in training to attempt to qualify for Boston. I had began my training with Karla and although I was not focusing on 5 K's, I had run several with her trying to get her under 24 and using them as tempo runs for my marathon training. On that day on 2005 though I decided to see how fast I could run and surprised myself by running 21:12 at age 49 in the fastest time I had run a 5K in 15 years. We returned last year and I used the race for fun again and to gauge my progress as I began on my quest to once again qualify for Boston. I was a bit disappointed in my 22:43 time on a warm muggy morning but Karla ran a pr and my friends Margo ,Maureen, Laura and Katie all ran very well and Frank and Jerry were along for the fun too. So it looks like we'll be going back again to test our speed before going back for some more 50k and marathon action. I am hoping that by some miracle I might crack the 21:00 barrier again but I don't really see that happening and will be happy to go under 22 just three weeks after racing hard at Lehigh Valley. I think if I were to focus on 5k and do my track work at the paces needed I could run under 21 again but right now it's all about marathoning for the next 7 months and then back to the long ultras. Stay tuned for the results ! Nice! Hope we get a chance to meet in person. I will be in the back. Useful running tools or should I be running 5k's?